A prolific actor, Gary Busey has appeared in over 150 films spanning four decades, including the memorable iconic classics Under Siege, The Firm, and Entourage. Notably, he portrayed Buddy Holly in The Buddy Holly Story (1978), a role for which he won an Academy Award nomination for Best Actor and won the National Society of Film Critic’s Award for Best Actor. Busey began his show business career as a drummer, and appeared on several Leon Russell albums in that capacity, so music has always had a special place in Busey’s life. 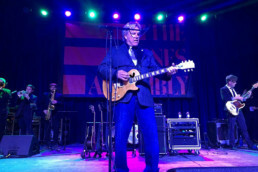 Today, music is front and center when Gary Busey takes the show on the road with his band The Hardtop Convertibles.